Thanks for checking out this product! There are 2 versions of the game included. 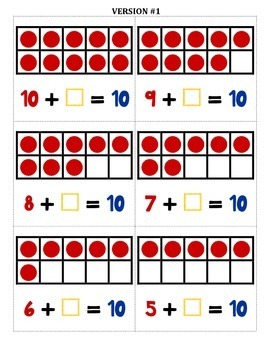 One version shows colored 10-frames with the corresponding equation listed below it (9 counters in a frame with 9 + _ = 10). 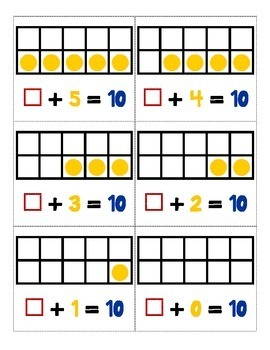 The other version includes colored 10-frames with the corresponding addends listed below it (9 counters in a frame with 9 + _). Choose the version that meets your students’ needs! 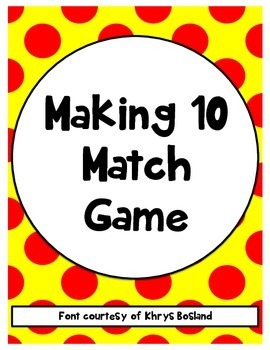 •	Print the game cards on white construction paper or cardstock. 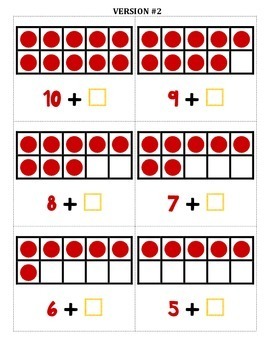 This is a simple matching game for 2-3 players (ideally). The game is played by putting all cards face-down on the table. The first player picks 2 cards. If the 2 cards MAKE TEN, they are kept. The player gets to pick again! If the cards do not match, they are returned to the table, and the next player picks. The game is over when all cards have been removed from the table!